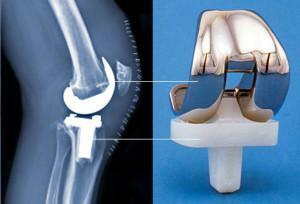 A traditional plastic and metal knee implant. Over the years many different materials have been used to make bone and joint implants, including a wide range of plastics, ceramics and metals like titanium, with varying results. The one thing that all of these implants have in common is the fact that they simply won’t last. Typically a medical implant will need to be replaced in about 10 to 20 years, which can cause more pain and trauma to the patient, especially as they age and surgery becomes more of a risk. Additionally, these implants are mass produced, making them, essentially, one-size fits all. Unfortunately not every patient is the same size, so either the implants need to be modified to fit during surgery, or the bone needs to be shaped to fit the implant, which often doubles the length of the procedure. University of Toronto professor emeritus Bob Pilliar has been researching synthetic bone substitutes for more than twenty years, and he and his team of researchers finally found their secret ingredient. Calcium polyphosphate is the mineral that makes up more than seventy percent human bones, and Pilliar believed that it was the ideal material to make a bone substitute. Not only was it biodegradable, but it could actually be used to connect to the patient’s existing bone cells to encourage regrowth and create a longer-lasting replacement. Pillar’s team only needed a way to manufacture the bone implants quickly and accurately, which is where mechatronics engineer Mihaela Vlasea comes in. The University of Waterloo 3D printing expert had just graduated in 2008 when she was asked to work with the research group at the University of Toronto. Her background in engineering and additive manufacturing was just what Pillar was looking for, so rather than heading off to med school, Vlasea decided to build a state of the art 3D printer instead. The printer that she designed and built would 3D print bone-like structures from calcium polyphosphate, including a natural, porous surface and nutrient-carrying channels inside of it. The printer can be used to print bone and joint replacements that will naturally bond with existing bone, tendon and joint material. Mihaela Vlasea and her bone implant 3D printer. The massive, refrigerator-sized 3D printer uses ultraviolet light and a light-reactive binding agent to fuse the powdered calcium polyphosphate into a biodegradable bone scaffold that has an intricate internal network of porous features. The physical structure of the 3D printed implant will encourage natural bone cells to migrate, and grow, into the scaffold implant. Slowly, as the implant begins to be broken down by the patient’s body, real tissue will begin to replace it. The surface of the implant will also encourage cartilage cells to naturally attach to them, ultimately making the implant more mechanically compatible than traditional implants. “It’s a little short of Star Trek where you zap a person, and they’re fixed, but it’s along the same lines. It is nice to think of replacing joints and getting rid of all these metals. But in the short term, we are looking at substituting small regions of bone. If we’re successful, you can imagine trying to re-generate a larger region of a joint,” Pillar told the Toronto Star. One of the more exciting applications for this 3D printed bone material is in creating replacement joints and cartilage for people living with arthritis. While most people believe that arthritis primarily afflicts the elderly, in fact many types of the degenerative joint disorder are caused by trauma or infections in patients of almost any age. Unfortunately cartilage cells do not regenerate, so the available treatment options capable of stimulating joint repair are limited to implants made of plastic or metal. Dr. Rita Kandel is the chief of pathology and laboratory medicine at Mount Sinai Hospital, and she has been working with Pillar and his fellow University of Toronto researcher Marc Grynpas for twenty years. She is developing a method of using Pillar’s calcium polyphosphate bone material and Vlasea’s 3D printer to create biological joint replacements made from the patient’s own tissue and cellular material. The process starts by extracting stem cells from a patient’s bone marrow, which are then reprogrammed into immature cartilage cells and then matured over a period of several weeks by Dr. Kandel. The bone implant 3D printer. Once the cells have matured, the patient’s custom 3D printed calcium polyphosphate implant is immersed in a bioactive material containing the stem cells. When these replacement joints are implanted into the patient, the new cells begin to function naturally and they will even start to heal themselves. This process is called “biological resurfacing”, and it will reduce the chance of the body rejecting the implant. It could eventually lead to more natural, longer-lasting joint replacements, especially for chronic conditions like osteoarthritis. “If you are using the individual’s own cells, they are not recognized by the body as foreign. It will help people so they don’t experience as much pain. For me, that’s a major contribution,” Dr. Kandel says. Currently the 3D printed bone replacements have only been tested on animals, and those trials are expected to continue for a few years. Dr. Kandel and her joint implant replacement process is closer to being available, however there is currently no time table for availability, or a known price point. According to Dr. Kandel, these new bio-replacement articulated joints could be used to repair damage to knees, hips and fingers, and they will likely be available within a decade. Discuss in the 3D Printed Bone Scaffolds forum over at 3DPB.com.